Today I read a blog post by the Brave Girls Club founder, Melody. It was a heartfelt message and one that resonated deeply within me. 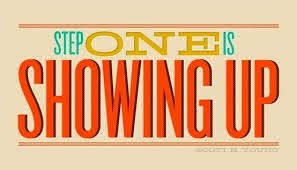 Showing up is often times the most difficult part. These days showing up seems to be the challenge. I have lost my spark...sure...I pretend, but on the inside I feel nothing. Work has become a place where I go...not the place that I love. Watching my home be torn apart brick by brick is disheartening. Looking under the bricks to find the silver lining is becoming more difficult. I once wrote about otters holding together when the seas are rough. Right now, the sea is very rough and I feel like I am grasping frantically to see if my raft of otters is still there. We are all clawing...the raft has been broken apart, the strength of it weakened over time. I continue to show up...with a smile...reaching my hands out...grabbing whoever I can...whoever is there. I am trying to protect myself from the rocks, from the waves that threaten us. When the day is hard...show up. When I want to cry...show up. When I am frustrated...show up. sad...show up. This is what we do...it is what is expected. When the journey is difficult...just show up. Make a stand...be a presence. Just show up and you are one step closer to being there...which, frankly, is a better place that just standing without moving at all! !